We all know how much Google has put efforts to make Google Maps the biggest location search engine. Google Maps provide us with so many features like add stop, master navigation, voice navigation, it also helps us to download offline area over wifi such that it will help you to limit your data usage and helps you to save a few bucks. Google maps now allow you to make your own map also as the map maker is graduating to google maps. Earlier Google Maps were not so common to people , but now everyone knows what google maps are and how can they help us to go to some places, malls, nearby shops and what not. Google map also allows us to make our own map by marking the locations or places you had been to or by making the groups of the places which can help you later to look over the locations. 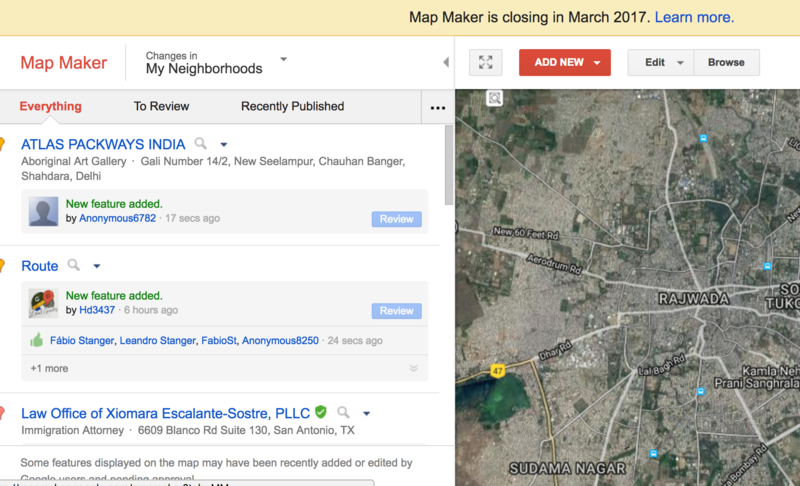 This map maker feature of Google maps is expected to be closed by March 2017. Map maker feature of Google maps allow you to mark your favorite restaurants, or maybe your favorite club and resorts or it could be anything. Google map maker has shifted to Google maps as they are adding one more feature to Google maps , now users can easily add a place, add information about the place or can edit the existing information about the place, moderate the edits and of course you can also see the status of your edits. one can continue contributing to the google maps about the local knowledge by joining Local guide community , which can earn you points and rewards for submitting edits and providing other information. So people , now backup your map maker data before it gets Graduate to Google maps. So, from April onwards we will not be able to mark our own map or grouping the different entities with different makers on Map Maker.